Note: If you listen to The Catholic Geek Radio Show, the following may seem familiar. You may have noticed a new segment on the blog under “The Church.” It’s called Strawpope Frank. Because, let’s face it, every time the Pope says something, the media headlines it as something completely different — much like a Monty Python sketch, only not as funny. Ever since Pope Francis was elected, I’ve been told that he’s been part of a particular sect called Liberation Theology. It’s basically the equivalent of saying that no, the Pope actually isn’t Catholic, and that he’s going to destroy the foundations of the Catholic church. Recently? I’ve had that to the tenth power. I’ve had to listen to a LOT of crap. For months it’s been “Oh, the Pope is a Godless Commie leftist.” Every other schmuck wants to say the “Sky is Falling!” “Schism!” Death! Doom! Despair! But no, no one wants to read ANYTHING the Pope says, whole and entire. A lot of people want Francis to be “a dirty commie,” and to heck with you if you say different. These people WANT a schism. They WANT the sky to be falling! We talk about peace. They don’t want peace. We talk about cooperation. They don’t want cooperation. They want a war. They want a war? Well they’ve GOT a war. It’s hard to tell where to start with the the Pope . But let’s do something simple, and take a breath. Breathe in. Breathe out. Breathe in. Breathe out. Because I’m tired of conversations that start “Pope Francis is a godless commie!” Or Liberation Theology! Or his advisers are all evil atheists! Let’s cut through the hysteria right now, shall we? I’m going to start with addressing a few general concerns before we go into some specifics. Step 1: Is the Pope a Liberation Theologian? I say that would be a cute trick considering that Pope John Paul II condemned Liberation Theology, and promoted Pope Francis as he came up through the ranks. 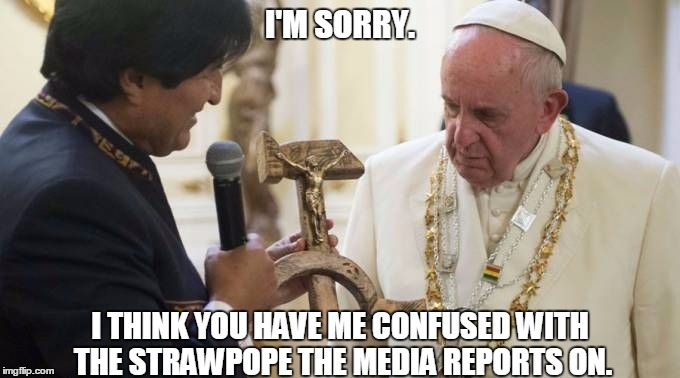 Take a look at Francis and the Commie Cross, and tell me he’s a commie. Step 2: What about the Pope’s advisers? I’ve seen a lot of articles on the people “advising” the Pope lately, and, frankly, I don’t buy it. Why? First, because a lot of these people have Doctor before their name, PhD after their name, but no Father, Bishops, or any other rank of holy orders. When you see a layman saying that he’s a special adviser to the Pope, take it with a pinch of salt and a shot of tequila. At this rate of speed, if all the people who say that they’re advisers to Pope Francis actually were, any gathering of them would look like Woodstock. You want to talk about who the Pope hangs out with? Pope Benedict was colleagues and friends with Hans Kung. The joke with Hans Kung was that he wouldn’t allow himself to be made Pope because he’d have to give up his infallibility. I didn’t hear anyone complaining that Benedict wasn’t Catholic. This point also assumes that Francis listens to anyone in particular. To be honest, I don’t like some of his priestly advisers. The ones I know of are anti-Israel. But just because someone whispers in Francis’ ear doesn’t mean he’s paying attention. Step 3: Let’s talk the “Global Warming encyclical.” That’s a problem right there, because I have yet to get to a part of the encyclical that requires Climate Change as part of Catholic dogma. Seriously, have you read the encyclical? Francis linked the value of human life to conservation! He’s talking about the value of human life over other animals! Save the whales AND the baby humans! There are men, there are women, and there IS NO OPTION C (someone told him about Bruce Jenner). GASP. It’s almost like it’s in tune with the encyclicals of past popes! I was promised something DIFFERENT!!!! This actually circles back to the adviser argument. Someone commented on my blog that there was a German scholar and Malthusian atheist advising on this encyclical. If you are not aware of Malthus, he basically said the population of the planet cannot be supported by the planet, and therefore, we should probably cut back on breeding, because people are the problem. Also, the poor are poor because they have too many children, and the solution is to cut down on their children. Funny, sounds like abortion. Which means, however, that this Malthusian, named Schellenhuber, can’t be as influential as he thinks he is, because the encyclical said that humans are as much a part of the ecosystem as anything else, and baby humans should be saved right up there with the whales, and are more important than that. Yes, Schellenhuber is an official Vatican scientific adviser. One of eighty. Step 4: The Pope made an off-the-cuff remark about weapons. Every news report seems to talk about guns, but what he said was weapons. In the context was weapons of genocide. If you go to Lori’s post, you’ll see an argument that says the Pope meant WMDs. Personally, I thought he meant Nicolas Cage in Lord of War – arms dealers – not Glock or Remington. And if the Pope meant handguns period, then his Swiss Guard detachment must be sooo confused right about now. However, if you read the transcript … is it the translation? Or is Pope Francis rambling a bit? Because the transcript is almost incoherent. One final note. The Catholic Church “agreeing” with climate change — or ANY scientific principle — is odd. I think the most they said about evolution was that it wasn’t antithetical to the faith. That’s why I keep thinking that this global warming crap has got to be all about the Pope’s personal opinion, and not about doctrine. A personal opinion is basically off the books. For what it’s worth, I will agree with the sky is falling crowd on one thing. And only one thing. It’s that I miss the days when we had a Pope who explained theology to the world, and didn’t force us, the lay people, to explain him to the world. But even if I had no faith in him at. All. I have faith in 1) God, and 2) The men of the Vatican installed by JP2 and Benedict. The ecclesiastical ship turns very, very slowly, and it has to turn through a lot of the faithful. I would like it, very much, if we can all put this subject to bed. This entry was posted in Commentary, Rants, The Church and tagged Abortion, Climate Change, Liberation Theology, Pope Benedict XVI, Pope Francis, Strawpope Frank, Transgender. Bookmark the permalink. Yes. Very Yes. Both Secular AND Catholic people should give Pope Francis the benefit of the doubt BEFORE posting/critiquing. Your post was very informative. I’m not Catholic, so I appreciate the explanation. All you really get anymore from either conservative or progressive media are the blurbs they think will get you to click their articles. Yes, that’s the problem as of late. It seems like the loudest voices are the ones who don’t care what anything actually is, but rather what they can make it out to be. I was once at a party where the topic of media bias came up. The party was a non-denominational gathering of Christian geeks, and I had no clue what political mix was present. I didn’t bother finding out. I just asked the knot of people around me “You know what it’s like when some news reporter gets something blatantly wrong on a topic you happen to know a lot about?” There were knowing nodds, and one guy who worked in computers outright laughed, saying it happened all the time. There’s no way that everyone can review everything, but if something seems fishy to you — if something seems to fit neatly into a narrative — then it’s likely something was left out. If you can, do the research yourself. If you can’t, remain skeptical until you’ve seen evidence.